WAG Alert -The Ultimate Manchester United WAG XI. Dan Fitch, from Betfairs Betting.Betfair Blog writes - It’s all very well being brilliant at football, but what use is that if you’ve got no one to cook your dinner for you, or tastefully furnish your Alderly Edge mansion? Behind every good footballer is a good WAG. Here’s a team of the girls who stand united with the boys from Old Trafford. Evelina is the missus of Tomasz Kuszczak and our team’s goalkeeper. Leanne is married to Wes Brown and is the mother of his two children Halle and Lilia. Oh la la… United’s French left-back Patrice Evra is married to Sandra. Most WAGs are interested in their partner’s finances, but very few have a degree in economics like Nemanja Vidic’s wife Ana. 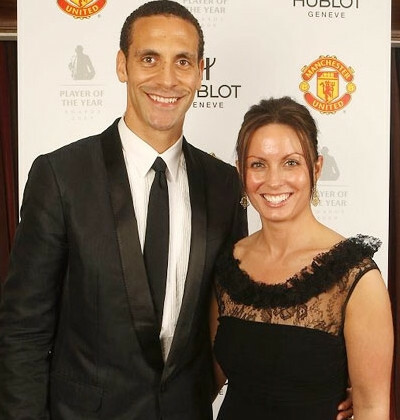 Pity the poor wife of Rio Ferdinand, who has to put up with his daily merking. Surprised that Scholes’ wife isn’t a minger? Well he has always possessed brilliant ball control. 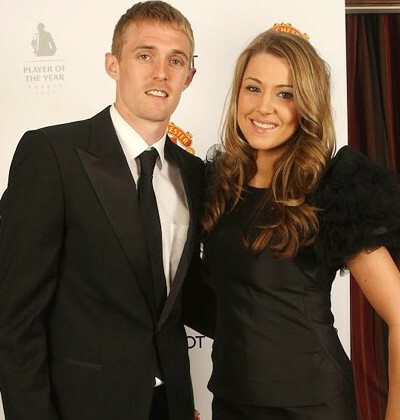 As this picture of Darren Fletcher’s wife Hayley proves, the Scottish midfielder is another United player boxing outside his weight. Providing some flair on the flanks, is Nani’s girlfriend Daniela Martins. Having dallied with Dani Behr and that one out of Hollioakes, Giggsy settled down with his wife Stacey. Few WAGs have made better use of their fame than Coleen Rooney, who has carved out a career as a columnist and TV presenter. Dimitar Berbatov may not be the most popular United player, but his girlfriend Elena Shtilianov looks like the star performer in our WAG XI. Our team of pampered WAGs are probably used to receiving the hairdryer treatment at their local salons, so Fergie’s wife Cathy should be able to keep them in line. Does Capello have any ounce of gravitas with his rules and regulations he has set during the World Cup? What with the terrible display against Algeria a few days ago it now also seems that the WAGs have started making their way into the camp – against his express rules. Glen Johnson’s wife Laura was in the crowd at Green Point Stadium in Cape Town two nights ago together with their baby, although both looked bored by the end of the match. Glen Johnson’s wife is not the first WAG to sneak into South Africa under the nose of the strict England manager Fabio. Emil Heskey’s girlfriend Chantelle Tagoe didn’t waste time getting to South Africa before the tournament had even began, flying with Heskey’s parents. Word in the Wag world is that even the ladies who have listened to Capello are now thinking about traveling out to support their footballing loved ones. Coleen Rooney held a backyard barbeque last weekend when England drew 1-1 with USA and who then hinted she might be thinking of traveling out sooner rather than later. It might be just the thing Wayne needs to focus his mind and start playing as we all know he can. After his snappy remarks back at fans following the draw with Algeria it seems that Fabio’s ban on WAGS, booze and video games might not be to the benefit that he planned them for. John Terry’s wife Toni Poole has said she plans to fly out if England reach the quarter-finals, and captain Steven Gerrard’s wife Alex Curran will attend the semi-finals if England are playing. Peter Crouch’s partner Abbey Clancy has said she will travel if the team contest the final. World Cup Wags say bring on the WAGs.. It’s obviously what the boys need..
Whilst Coleen is proud of husband and England star ‘the last thing she wants is to distract him,’ a pal who’s known her since her school days tells Now Magazine. It was during the last World Cup in 2006 that Coleen became associated with the WAG movement. She was a bit starstruck first of all and threw herself into the lifestyle. ‘She spends all her time with friends she’s had since she was 15,’ says Now’s source. ‘Friends and family mean everything. To call her a WAG these days is unfair as she’s deliberately stepped back from the spotlight. See the full story about Coleen Rooney in Now magazine dated 21 June 2010 – out now! 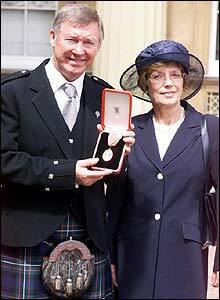 You are currently browsing the archives for the Coleen Rooney category.